Update: Game updated to XNA GS4.0 , Download links added! 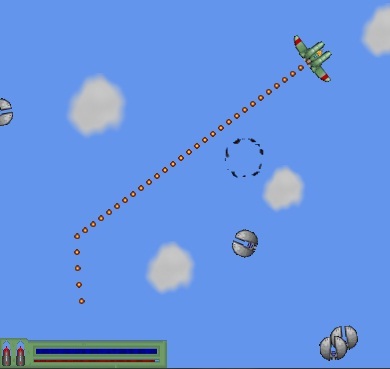 This was my first XNA game! It’s a cool 2D Game..
You have to defeat the invaders as they increase in number, you’ll also come across mother ships which are more advanced enemies that will chase you and fire energy pulses at you!. Play for some time and you’ll confront the Main Mother Ship…you think you’re up to it??? You have two weapons to stop your enemies : a rail gun that will fire small rapid bullets , and a missile launcher that fires missiles causing massive damage to your enemies! 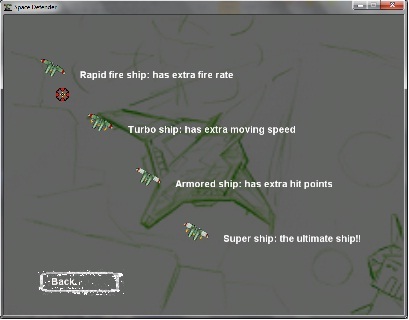 The player can choose one of three Space Ships to play the game with… each space ship has it’s special ability : Rapid Fire, Turbo Ship, Heavy Armor…and if the player beats the game twice with two different ships, The ultimate ship will be unlocked! 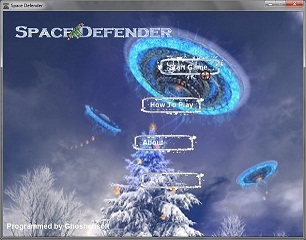 Instructions on how to play the game can be found under the How To Play window in the game. Taking the repairs box is always a good idea!! a small white repairs box will show up from time to time! take it to regain health. If you don’t have the XNA 3.1 SDK installed on your computer, you’ll have to install the XNA Redistributable 3.1, download it here for free. Game Dialogs : since I couldn’t find XNA compatible classes to use for dialog boxes, I had to write my own, so I started with programming the Button class which almost simulates a Windows button. I used the former three classes to build some special dialog boxes..
Sprite : which is an abstract class which all the ships,invaders inherit from , it’s a very common class.. Cloud Manager : a class the manipulates several clouds to give the effect of the cloudy sky, It creates clouds with random positions,sizes and speeds. I created two instances of this class, one is drawn behind the scene, the other is in front of it! which adds a really cool effect to the sky! sprite sheets : found them on the internet…I don’t really remember where! Here you’ll find the full source code : a Visual Studio 2008 Solution, Have fun! Enter any password and the project should compile correctly! Screen shots look cool, the link for the source is broken, can you please repost? Mediafire.com doing it again! randomly blocking files in the name of “terms violation”! I updated the links to Dropbox links, thanks for notifying me :). Dude you are amazing!! Thanks really! Thanks, I’m glad you liked it :). Hi Bro the link is not working to download this.